Check out this latest recipe from the Summer 2018 issue of Rooted, which you can read online by following the link below! Read the Summer 2018 Rooted now! Pour the cream into a chilled mixing bowl. Scrape the vanilla bean into the cream and reserve the pod for another use. Whip the cream to soft peaks and add the condensed milk. Continue to whip until the peaks stand at attention. Fold in the vodka (to prevent over-freezing!) and place mixture in the freezer. Combine all ingredients in a bowl and refrigerate overnight. The next day, transfer the mixture to a saucepan and cook over medium heat until the texture becomes similar to jam, around 10 minutes. Remove from heat and let cool. Preheat oven to 450°. Toss your chickpeas with the oil and roast in the oven until crisp, around 25-30 minutes. Combine sugar, butter and cream in a saucepan over medium heat. Cook until the mixture darkens and starts to bubble. Add chickpeas and stir, then remove from heat. Pour mixture onto a sheet tray with parchment paper, and flatten. Cool to room temperature, and break into pieces to serve. 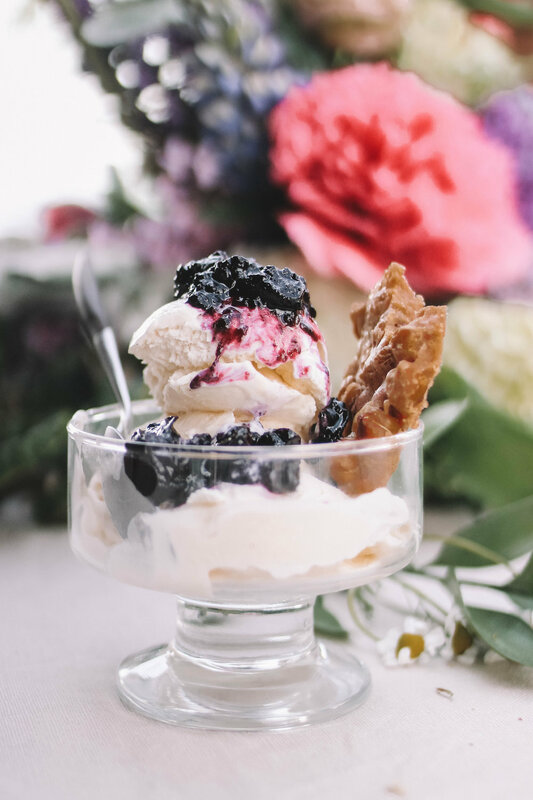 To serve, scoop ice cream into your favorite dish and top with brittle and compote!